Observations have long shown that convection in the tropics tends to be trimodal, including shallow cumulus clouds (cumulus humilis or mediocris with tops up to 2 km), congestus clouds (with tops up to the freezing level) and deep cumulonimbus (up to the tropopause). Shallow cumuli dominate the subtropics and tropics, and currently receive much attention for their role in cloud feedbacks and climate change . But observations show that episodes of shallow cumuli alternate with episodes of deeper cumulus congestus, which have a much higher propensity to precipitate. Whereas deep convection occurs in the ascending branches of large-scale overturning circulation (Hadley/Walker circulations), shallow cumulus and congestus occur in subsiding branches. What sets the depth of convection in the subsiding branches? Which interactions between the deep convecting and the subsiding areas influence the depth of convection and the distribution of precipitation within circulations? These questions have motivated me to use a simpler conceptual two-column model, with parameterized physics, to elucidate controls on the depth of convection in a large-scale circulation. The model produces congestus, despite not representing the melting of ice. In a recently submitted publication, we show how the depth of clouds in subsiding branches depends on an intricate interaction between radiation, convection, momentum diffusion, microphysics, and the circulation. Below figure: a schematic of the two-column model framework. The SST of the rightmost column has been lowered, and convection over the colder ocean has collapsed. A circulating equilibrium between the two columns has been established, with mean ascent over the warm ocean and mean descent over the cold ocean. 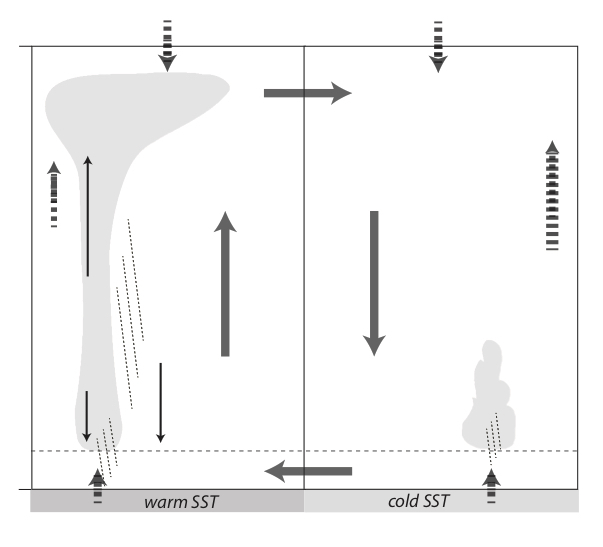 Nuijens, L. & Emanuel, K. (2017): Shallow cumulus and congestus modes in circulating equilibria of the tropical atmosphere in a two-column model. Submitted.